AssistX Mobil is a wireless home and nurse call system with connection for any triggering sensors, switches or push-buttons with 3.5 mm jack plug. Secure wireless home and nurse call system according to DIN VDE 0834. The basic system consists of transmitter, receiver and a USB charger. The receiver can be easily carried on the belt using a clip. 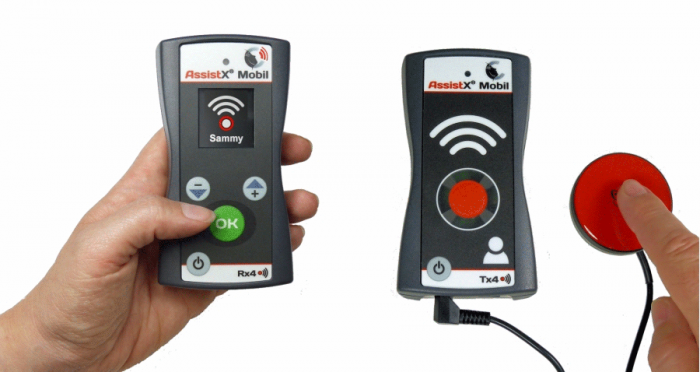 The AssistX Mobil radio paging system is the ideal solution when nursing care with mobility and safety at the same time is required. AssistX Mobil is connected in less than 5 minutes and easy to use. Depending on the level of disability, special sensors for triggering the distress call can be plugged into the transmitter's connection socket. This allows even people with the most severe disabilities to make a call with an individual sensor. Several transmitters, as well as several receivers can be used together. Thus, the system is also particularly suitable for use in small residential groups. The name of the caller or the room is displayed in plain text on the display of the receiver(s). By pushing the button or operating a plugged in push-button / switch, a radio paging is triggered by the transmitter. This is signaled visually and acoustically to the caller. The radio paging is picked up by the receiver and signaled visually, acoustically and by vibration. The receiver then sends back an acknowledgment signal to confirm proper reception. If this acknowledgment signal is missing, the call is repeated automatically. The caller recognizes the acknowledgment by the light of a red calming lamp. At the receiver, the call must be acknowledged by pressing the "OK" key. This stops the acoustic and optical signaling. After this, the triggered call must be acknowledged manually with the caller. If this does not occur within a certain time, the call process is automatically repeated from the beginning. AssistX Mobil is equipped with an AssistX port for call triggering. This one can be connected with any simple switches, push-buttons or AssistX Port compatible sensors. As a result, in addition to standard simple switches, the AssistX ProX one proximity sensor or the AssistX AS one acoustic sensor can be inserted directly into the transmitter and used to trigger the call. *No additional power supply or cable is required. The AssistX Mobil network communicates in the protected "Social Alarm" frequency band (869 MHz). This makes the system particularly protected against interfering radio signals from other devices. Both transmitters and receivers have installed a powerful Lipo battery with a running time of at least 24 hours as power supply. AssistX Mobil also features a range detection. If a transmitter is out of range, this is indicated in the receiver. A low battery charge status of the transmitter is also displayed in the receiver and alarmed before reaching a critical level. All calls are recorded in the receiver with their origin, date and time so that they can be evaluated later, if necessary. An individual name can be assigned to each transmitter. Battery life: Depending on the sensor inserted up to several days.